Wednesday, February 3, noon to 1:30 P.M. Professor Puar will analyze concerns related to the disability rights movement's efforts to call for inclusion based on normative, nationalist criteria of participation. Her presentation will draw upon the works of theorists of the corporeal such as Massumi, Deleuze, and Ahmed to imagine alternative modes of becoming. Professor Kolářová critiques the discourse of individual choice that shapes the debate on assisted dying. The discourse of choice calls upon specific heteronormative as well as ableist notions to re-configure notions of sociality, relationality, responsibility, and care. Case studies include German legislation regarding the “patient’s will,” British media coverage of the “voluntary death” of a young man, and the Spanish film The Sea Inside. Wednesday, April 21, noon to 1:30 P.M.
People with disabilities are served by organized agencies that hire and pay people–their employees–to do the serving. This fact is virtually taken for granted by everyone involved, even though it has not always been so, and it raises a number of troubling problems, such as conflicts of interest. This presentation will try to bring these various dilemmas to consciousness, and also point out how paid human services workers can address the dilemmas in their own lives, and “validate” their paid human service. We've had a good response to the call for hosting future editions of the Disability Blog Carnival--thanks all! I think this is the 2010 schedule so far; I'll amend, adjust, and augment as requested. January (#62): Cheryl hosted this edition at her blog, Finding My Way: Journey of an Uppity Intellectual Activist Crip. February (#63): The Disability community on Dreamwidth.org will host this edition, with the theme "relationships." Submissions due February 20, carnival posts February 23. March (#64): Athena, Ivan, and the Integral offered to host this one. They hope for submissions that address the question, "If you had a chance to strike down a single stereotype, which one would it be and why?" April (#65): Twxee will host this one at her blog, River of Jordan. May (#66): Terri will host at Barriers, Bridges, and Books, with the theme "Story." June (#67): Dave Hingsburger will host at Rolling around in my Head; his edition will be a Pride Day event, and will ask you to submit your own favorite post, "anything that you are really, really proud of." He'll explain more later, but for now, start thinking about that! 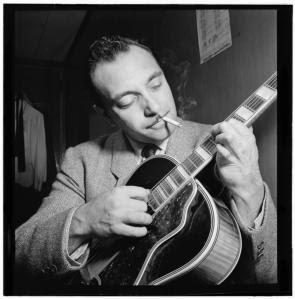 One hundred years ago this weekend, guitarist Django Reinhardt was born, outside the town of Liberchies, Belgium, in a Roma family. The teenaged Django found work playing music in a Paris dance hall. But at 18, the caravan he shared with his first wife caught fire. He was burned, with especially bad burns on two fingers on his left hand and his right leg. Reinhardt walked with a cane eventually, and returned to the guitar by making adaptations around his burned fretting hand. The result was a distinctive sound, and a legendary career in jazz. See and hear a snippet of Reinhardt playing in this YouTube video from 1945 (the visuals also include people dancing, boxes being unloaded from a truck, and ration coupons being clipped). ...and has been for a week. Sorry--we spent three nights in the PICU last week, amazing how that wrecks a week, eh? (Son is fine now.) But better late than never, here's the 62nd edition of the Disability Blog Carnival, hosted by Cheryl with the theme "Holidays." Funny, defiant, adorable, troubling--she's got every flavor of post in this big stockingfull of links. ...how has your disability affected your relationship with your family? How do you manage balancing friendships with a limited number of spoons? How well do your coworkers deal with your disability? If you haven't been or identified as disabled for your whole life, how did becoming/identifying disabled change your relationships? How does your disability affect your expression of your sexuality? What kinds of things do you wish your friends/significant other(s)/family understood better? How do your friends and family make your life better, even if you're running low on spoons? Basically, how does your disability impact (or not impact) your relationships with the people around you? Submissions are due February 20th for posting on February 23. You can leave links or email your links to Lauren according to her instructions over there. Now my confession: I think I offered March to two different hosts! If you're one of them, please get in touch and let me know if you're still available, if you're willing to do April instead, etc. "Lots of times you read an article about disabilities and have someone with cerebral palsy speaking about cerebral palsy or somebody blind talking about being blind, and then you have a family member talking about what it's like to be mentally ill and the interviewer seem to think that's the same thing, but it's not." 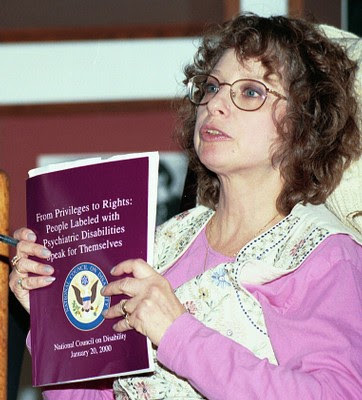 Psychiatric survivor activist Judi Chamberlin has died, according to a note posted on her blog, which documented her months with hospice care. Ray performed wearing a visible hearing aid (check out this video for example, which begins with Ray facing away from the camera, with the back of his right ear in the spotlight); it can be seen in some publicity stills, but in others it is not included. Road manager Tad Mann attributed the singer's distinctive sound and highly animated performance style to his concern for pronouncing words clearly and communicating through facial expressions and body language. While Ray was "out" about being a deaf man, he struggled in an era when homosexuality was criminalized. He was arrested, tried, and fined several times in the 1950s for minor incidents related to his sexuality. He experienced alcoholism and drug addiction for decades, and died from liver failure in 1990. Cheryl Herr, "Roll-over-Beethoven: Johnnie Ray in Context," Popular Music 28(3)(2009): 323-340. When I was ten years old my parents put me in Sonoma State Hospital. They had four little kids and another on the way. This was during the depression. I lived at Sonoma Developmental Center for over 45 years. I was asked to live with a foster family in San Francisco. The Foster Mom died of a drug overdose. because there was no other place to go. I lived there for 5 years. It was certainly not much of a life. I had no choices about anything. I was told when to eat. What to eat. Where to go and when to go there. They did not know I was an artist. They did not know that I could sing. They did not know that I had the right to vote. I think people should have respect for one another. doesn't mean we don't understand what is going on. We have good minds and good ideas. Let us have a voice in the decisions which effect us. I now live with my best friend Laura Lee. We live and work together as a team. I use In Home Support Services. Alta Regional Center pays for my transportation. where I am an artist, performer, and teacher. I know a lot of people who need services to live in the community. We need homes we can afford. We need Supported Living services & choices in providers. Each person's support needs are different. Today there are a lot more choices than when I was a child. But even with all of the choices that we have now. Why do we still need institutions? when they deny people their freedom? And open the doors to community living. "My early reminiscences reach back to a period when I must have been about three years old, or little more. I remember of being carried to Kelso when about that age, and being tormented by doctors examining my limb, and making me wear a red morocco boot, with steel bandages to keep it in some prescribed position. These appliances were of no advantage, and were, ere long, superseded by a pair of crutches. The latter I soon learned to use with such ease and adroitness that, during my boyhood and youth (when I generally enjoyed robust health), I felt but little incommoded by my lameness." Pringle's later adventures included a six-year stint as a librarian in South Africa, where he was an early publisher of English-language news and literary publications. His work in publishing and abolition led to his role as the recorder of Mary Prince's narrative, which was published in 1831. Pringle died three years later, from pneumonia, age 49. On behalf of the editors of Disability Studies, Temple U., I wish to publicly express their sadness at the death of scholar, colleague and friend Chris Bell. Chris was an active contributor to organizations such as the Society for Disability Studies and the Modern Language Association, engaging us all to think about how to broaden the reach of, and reconceive of the reach for, Disability Studies. He sought opportunities to challenge, cojole and coax out work that engaged in questions of intersectionality and hybridity - even turning up unexpectedly at our Disability Studies public lectures last fall to engage w/ Nirmala Erevelles. Ann Keefer and I had the opportunity to visit Syracuse for last spring's conference on Disability Studies in Education. Chis was happy to share with us his newly adopted home town, so it can be hard for us thus reconcile the confidence we saw back then with the distressed man whose life with the onset of winter's chill. We are all better for counting him as friend and colleague, saddened to have him taken from us too soon. Details on Chris' scholarship and further tributes from his friends and colleagues can be found at Beth Haller's blog. So it is gone! -- another year! In which we all must disappear! And could have died so very blest! Nack, a lifelong New Yorker, was deaf after a serious head injury when he was nine years old. He was among the first successful alumni of the New York Deaf and Dumb Asylum, which he attended from 1818 to 1823. He worked in the office of the Clerk of the City of New York for many years, and frequently contributed poems to the New York Mirror. He published several volumes of verse, starting with The Legend of the Rocks and Other Pieces (1827). 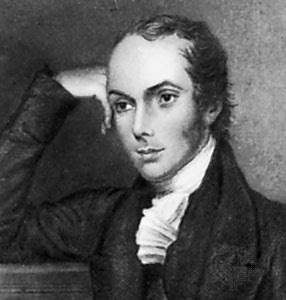 Much of his poetry celebrates his happiness in family life--he married in 1838 and was the father of three daughters (including Eveline, above). Nack also did translations from French, German, and Dutch. Several books of Nack's poetry are available in Full view on Google Books (The Romance of the Ring, Earl Rupert, and The Immortal, for three). Christopher Krentz, ed., A Mighty Change: An Anthology of Deaf American Writing 1816-1864 (Gallaudet University Press 2000). John Lee Clark, ed., Deaf American Poetry: An Anthology (Gallaudet University Press 2009).